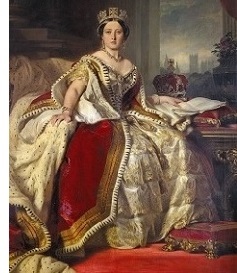 Queen Victoria (1819-1901) - Alexandrina Victoria became Queen of the United Kingdom just after her 18th birthday in 1837, and sat on the throne for over 63 years. It was the second longest reign of any monarch in England as well as the longest of any queen in history until her great-great-granddaughter, Queen Elizabeth II, broke both recently. Her name comes from her godfather, Tsar Alexander II of Russia. When her predecessor, King William IV, died with no legitimate heir, the crown passed to her through her father, Prince Edward (William's younger brother). Royalty in Old Europe was very much a family affair and she married her first cousin, Prince Albert. They had nine children, all of whom married into royalty (a feat which earned Victoria the nickname "Grandmother of Europe"). However, Albert died at the age of only 42, leaving the queen a widow for forty years and suffering from severe depression for the rest of her life. But under her reign, Great Britain grew in size and industrial might, making her one of England's most beloved figures ever (it was said at the time that the sun never set on the British Empire). By the time of her rule, England had transformed into a constitutional monarchy, meaning that her power was limited; however, she did have influence on national policy and cabinet appointments making her effectively the last British monarch with any real political power. So prominent was she in British society that the last half of the 19th century is referred to as the Victorian Era.